In America, Jay Z’s controversial, little-loved streaming music service Tidal has been trying to establish itself as the offer that music lovers simply can’t refuse. Sure, no one actually wants to sign up for a Tidal account, but the company has been busy nabbing all kinds of exclusive, high-profile releases, such as Kanye West’s The Life Of Pablo, that people will want to hear, regardless of the middleman. In Japan, however, there is no such thing as Tidal. The service has not yet reached that country, so fans can’t sign up even if they wanted to do so. 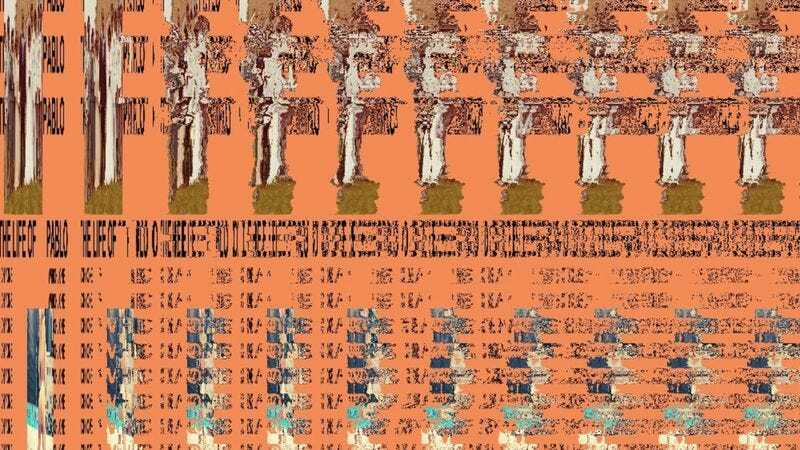 As reported by Ramon Ramirez in The Daily Dot, one West fan dealt with that frustration in a unique and highly creative way: He made his own damned version of The Life Of Pablo, complete with a glitchy-looking remake of that album’s famous orange cover. Toyomu’s Imagining ‘The Life Of Pablo’ is currently available for streaming or purchase through the musician’s Bandcamp account. So how was this accomplished, since the producer had not even heard The Life Of Pablo all the way through? He just did a little online homework. Tomayo nabbed the album’s lyrics from Genius and the list of samples West used from Who Sampled. From there, it was a matter of putting them together in a way that made sense to him. Imagine trying to bake a cake with a recipe that just includes the ingredients but no actual step-by-step instructions. That’s largely what this is. The “rapping,” if it may be termed such, is handled by a chirpy, genderless synthesized voice. It’s more like robotic reciting. The musician identifies it as a Mac text-to-speech application. The music beneath it is self-consciously weird and abstract. The end result is not so much a recreation of The Life Of Pablo as it is perhaps the dream of someone who listened to that album a day before and only half remembers it.